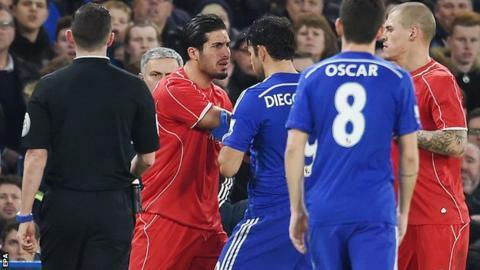 Chelsea striker Diego Costa will contest the violent conduct charge he faces over an alleged stamp on Liverpool's Emre Can on Tuesday. The Spain international was charged by the Football Association on Wednesday over the incident. He is being charged for the first of two alleged stamps that were not seen at the time by referee Michael Oliver. Costa also appeared to stand on central defender Martin Skrtel in the Liverpool penalty box in the second half. The first-half incident involving Can took place close to the technical area and prompted an angry response from the Liverpool player. The disciplinary case is now set to be heard by an independent regulatory commission on Friday, which will make a final ruling over whether Costa must serve the suspension for his charge. Should the forward be found guilty, the first of a three-match ban would come in Chelsea's top-of-the-table clash against Manchester City on Saturday. It is understood Costa is appealing with the full backing of Chelsea. Chelsea cancelled their pre-match news conference for the game against City on Thursday afternoon. Costa could also miss games against Aston Villa and Everton. Liverpool manager Brendan Rodgers said after the League Cup semi-final: "He could easily hurdle over the young player and he directs his studs right on to his ankle, which could have been nasty." Chelsea boss Jose Mourinho said after the game that he feels the Brazil-born player is being targeted unfairly. The Blues, who won 2-1 on aggregate, will face London rivals Tottenham in the final at Wembley on Sunday, 1 March.